For anybody with visual impairments, tasks such as using standard computer keyboards can be cumbersome due to small keys and lettering that is often difficult to read. With the Geemarc Standard Big Letter Keyboard, the standard QWERTY layout is presented in a larger, more legible style that is just as practical as other, traditional keyboards, but with a bold print that is easier to read. The Standard Big Letter Keyboard features black keys in the standard QWERTY layout, with each key labelled with bold white lettering. This contrast makes the keys easier to read by allowing them to stand out more, helping to prevent keys from being mistyped. In addition to the practical black/white contrast, the lettering and key labels are also larger in size than average. This means that the keyboard will be ideal both for people with difficulty reading small letters and anybody with colour vision issues. 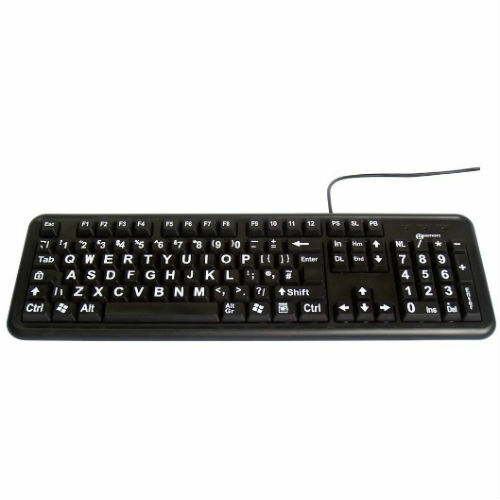 The 'plug and play' nature of the Standard Big Letter Keyboard means it can plug straight into your computer via USB for immediate use. This reduces the need to install complex drivers onto the machine, and also enables it to used with other computers remotely by unplugging the keyboard and relocating it elsewhere. The Standard Big Letter Keyboard is compatible with Windows XP, Vista, 7, 8, and 10. This product may be suitable for VAT relief, meaning that if you are buying this item, you do not have to pay VAT. Please visit our VAT Exemption Page to find out more about eligibility for VAT exemption and how to claim back your VAT after purchase. If you'd like more information regarding VAT Relief, please contact our customer care team on 020 7720 2266 and we'll be happy to talk you through the process. Please note: Not all products are eligible for VAT relief. Do you have a question about this product? We're here to help. Simply call us on 020 7501 1101 between 09:00 and 17:00 Monday to Friday. This item is usually dispatched by Royal Mail 1st Class post or better and, when in stock, is usually dispatched the same day if ordered before 2.00pm, Monday to Friday. Please call our Amplified Telephones customer care team on 020 7501 1101 if you have any questions about the delivery of this item. We hope that you are delighted with your order from AmplifiedTelephones.co.uk, but we understand that sometimes there may be a reason why you would like to return an item to us. We aim to make this returns process as simple as possible. We offer a 14 day returns policy on all orders, full details of which can be found here. 020 7501 1101Monday to Friday, 9.00am until 5.00pm. At all other times, please leave our team a message or contact us via email. Articles & GuidesA guide to Corded Amplified PhonesSmartphones for the hard of hearingBest phone for the elderlyBest hard of hearing Mobile Phones5 reasons to use a big button phoneWhat is a DECT Phone?